You all know how much we love Busch Gardens Tampa Bay. We even had an engagement session done there during Halloween. In 2012, Busch Gardens incorporated their first ever Christmas Town, a celebration of the holiday season at their park. It was a huge success. So successful that they brought it back for 2013 and it is bigger than ever. More lights (over a million! 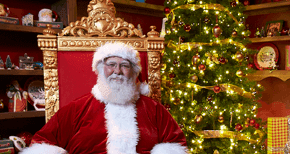 ), special Christmas entertainment, live music, festive treats, holiday shopping and more. I am very excited to start off my 12 Days of Christmas giveaway with a four pack of tickets to Busch Gardens Tampa Bay Christmas Town! We went to Christmas Town last year and had an amazing time. The most popular part of the event was SnowWorld® presented by Coca-Cola, which is returning this year with more snow! Busch Gardens Tampa created amazing attractions to help your family craft unforgettable Christmas traditions. This year’s event will feature a delicious holiday buffet with Mrs. Claus, incredible shopping, a flock of silly and fun penguins and more snow than last year! The Christmas Town Village is Gabe's favorite part of the event. Stroll through the Cabins and enjoy sweet and savory snacks. 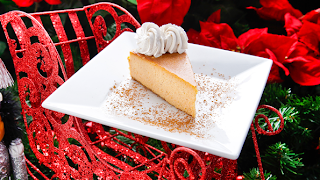 From freshly-made waffles with your choice of toppings, baked cookies, creamy hot chocolate, eggnog, turkey legs with a cranberry orange glaze, warm ham served on pretzel bread, mini holiday pies, caramel apples, Christmas Town’s signature Elf Munch, roasted nuts and more! 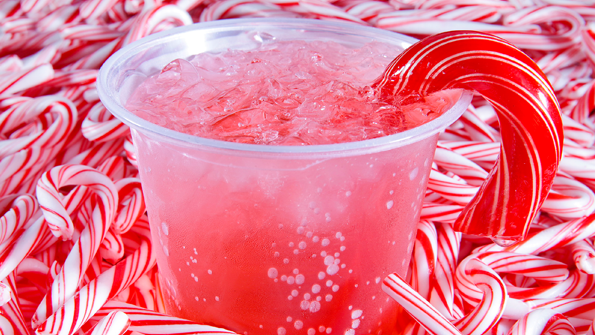 Nothing puts me in the holiday spirit like holiday cocktails and Christmas town has it! 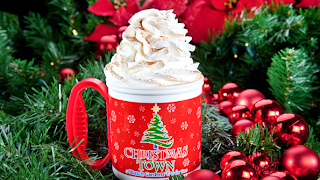 Sip on Eggnog, pumpkin coffee, Ghirardelli hot chocolate, Holiday brews and other adult beverages will be available. 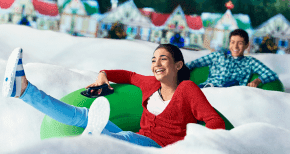 Christmas Town transforms Busch Gardens Tampa into a holiday wonderland filled with all things Christmas for 18 select nights, Nov. 29 through Dec. 23. Click here for dates, ticket and upgrade information. Don't forget to enter week one's other contests and come back next Monday for week 2! Make sure you leave a comment below letting me know what your favorite Christmas Tradition is! I love going to see the christmas lights at places like the Florida Botanical Gardens and Largo Central Park with my family. My favorite tradition is decorating the house with the kids. We have so much fun! Watching the kids decorate their bedroom Christmas trees. It's fun to see which ornaments they choose each year. Also making new ornaments each year for them to give to family. Baking Christmas cookies! I started yesterday. I love everything about the Christmas season! My favorite is the family get together on Christmas Day. My favorite tradition is going to Disney around Christmas time to see the castle light up and Osborne Family Lights. It is something we try to do as a family every year. This year I can't bare to stay over there without my husband. This would be a great alternative!!! My favorite holiday tradition is visiting the theme parks to see all of their holiday decorations and special shows. On top of the list are SeaWorld's Christmas Celebration and the Osborne Lights at Hollywood Studios. We usually have extended family with us as we enjoy the great festivities making lifetime memories. My favorite Christmas tradition is decorating the tree on Christmas Eve and drinking hot cocoa. It is also the evening to open the new pajamas for the year. Introducing holiday traditions to my daughter has been a blast! My favorite tradition is driving around looking at Christmas lights, then coming home to drink hot cocoa and watch a holiday movie as a family. My favorite tradition is decorating the Christmas tree with my daughter, and reminiscing over the ornaments and talking about the memories that come to mind when we hang them!! I love baking cookies with my son. My favorite tradition is on Christmas eve we get together and have our traditional Hispanic food and sing Christmas song waiting till its midnight so that the kids could open one gift then the next day we head over to celebration to watch the snow. Even though this year we will not be able to give a lot to the kids just knowing that they are healthy and that we are together celebrating is what Christmas to me is about. My favorite tradition is driving around to see all the beautiful light displays in the neighborhood. My favorite tradition is decorating the Christmas tree with lights, ornaments, etc. My favorite tradition is decorating and reading the Christmas story! The warm ham and pretzel sandwich was the best! Making the traditional "coquito" and decorating the tree. My favorite Christmas Tradition is watching "Die Hard" every Christmas Day! My favorite Christmas tradition is decorating the tree. The kids have been making ornaments every year now for several years and we also look to buy special ornaments. We love using more and more of those special ornaments instead of standard boxed ornaments. My favorite family tradition is purchasing a sweet smelling Christmas tree and putting it up in the house. Our favorite Christmas tradition is opening gifts on Christmas morning. My favorite tradition is decorating the tree while listening to Christmas music. We drive around and look at lights in the neighborhoods while sipping on hot chocolate. My boys have already begun asking when we are going. My favorite Christmas tradition is to watch "A Christmas Story" while putting up the Christmas tree on Christmas Eve. Almost everyone I tell this to simply laughs and questions why I would wait so long to put up my tree. Well, I started putting up my tree so late because back in 2005 my father and I were having a hard time getting in the spirit of things since my step-mother died the Monday before Thanksgiving that year and it took us a week to realize she would still want us to put up the tree and celebrate. We all get together and go see Santa together, then take an afternoon of movies, and shopping. When my children were little, and we lived near the cousins, we had a dollar gift party. We all went to the dollar store, and chose names then went home wrapped the gifts, had some great treats and exchanged gifts. It was always interesting to see what the kids bought for each other. I Love our family tradition of going to church on Christmas Eve and then we all go to one house and have lots of food & drink. My.kids grew up where they could open one gift on Christmas eve. One of my favorite family tradition is going Christmas caroling. My favorite Christmas tradition is helping my mom bake the many trays of cookies and then enjoying them with family and friends. Some of my favorite Christmas traditions are watching Christmas Movies, decorating cookies, and driving around looking at Christmas lights with the kids. My favorite tradition is sending cookies to my friends and family. I love baking and it's a great excuse to drop in and see my loved ones. My favorite Christmas tradition is piling everyone into the car and look at Christmas lights and decorations. eggnog and johnny mathis ! I love to spend time with my daughters making gifts for people we know who are in need. My daughters are my best friends. They fill my heart! We have never seen a theme park at Christmas, and I have heard it is magical. Thank you for giving me the chance to win this for them. Have a great holiday season with your family. Thank you for your hard work in hosting! my favorite Christmas tradition is passing the polish wafer around with family each person offering a blessing to the next... its very personal, emotional and sweet. Listening to classic Christmas music and putting up the tree with family.